A delicious fresh serving of a favorite soup. When Giant wakes up with a giant cold, he turns to his home medical guide for help. The prescription? A bowl of Boy Soup. Catching the boys is easy, but what he doesn't count on is Kate. 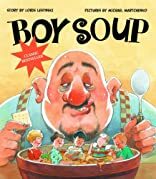 Accidentally kidnapped along with the boys, clever Kate convinces Giant that what the guide really means is a soup made by boys, not one with boys in it. and a generous dollop of dandruff shampoo. Giant spits out the soup with a mighty blast, which carries the children to safety. The happily-ever-after ending sees Kate and the boys opening up their own restaurant (minus Boy Soup), and Giant learning a valuable lesson. Originally published in 1996, this delightfully silly story has been a consistent favorite. 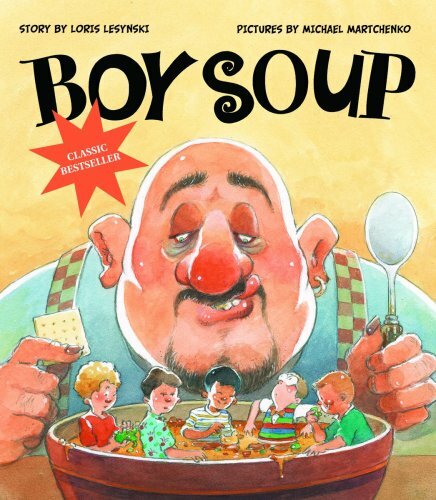 Now reissued with hilarious illustrations by renowned artist Michael Martchenko, Boy Soup is sure to attract a whole new generation of young readers.